Portugal is a country that has no coast along the Mediterranean Sea, only the Atlantic Ocean, so the country's advances in worldwide exploration centuries ago may come as no surprise. That said, it was the passion and goals of one man who truly moved Portuguese exploration forward, the man known as Prince Henry the Navigator (1394–1460). Formally, he was Henrique, duque de Viseu, senhor da Covilhã. Known For: He founded an institute for explorers, and people from around the world visited to learn about the latest discoveries in geography and navigation technology. Although Prince Henry never sailed on any of his expeditions and rarely left Portugal, he became known as Prince Henry the Navigator because of his patronage of explorers, who increased the world's known geographic information through the sharing of knowledge and by sending expeditions to places previously uncharted. Prince Henry was born in 1394 as the third son of King John I (King Joao I) of Portugal. At the age of 21, in 1415, Prince Henry commanded a military force that captured the Muslim outpost of Ceuta, located on the south side of the Strait of Gibraltar, on the northern tip of the African continent and bordering Morocco. It became Portugal's first overseas territory. On this expedition, the prince learned about gold routes and became fascinated with Africa. Three years later, Prince Henry founded his navigational institute at Sagres on the southwestern-most point of Portugal, Cape Saint Vincent—a place ancient geographers referred to as the western edge of the earth. The institute, best described as a 15th-century research and development facility, included libraries, an astronomical observatory, shipbuilding facilities, a chapel, and housing for staff. The institute was designed to teach navigational techniques to Portuguese sailors, to collect and disseminate geographical information about the world, to invent and improve navigational and seafaring equipment, and to sponsor expeditions. Prince Henry's school brought together some of the leading geographers, cartographers, astronomers, and mathematicians from throughout Europe to work at the institute. When people returned from voyages, they brought back with them information about currents, winds—and could improve existing maps and seafaring equipment. A new type of ship, called a caravel, was developed at Sagres. It was fast and was much more maneuverable than prior types of boats, and though they were small, they were quite functional. Two of Christopher Columbus' ships, the Nina and the Pinta, were caravels (the Santa Maria was a carrack). Caravels were dispatched south along the western coast of Africa. Unfortunately, a major obstacle along the African route was Cape Bojador, southeast of the Canary Islands (located in Western Sahara). European sailors were afraid of the cape, for supposedly to its south lay monsters and insurmountable evils. It also hosted some challenging seas: tough waves, currents, shallows, and weather. Prince Henry's expeditionary goals were to increase navigational knowledge along the western coast of Africa and find a water route to Asia, to increase trade opportunities for Portugal, to find gold to provide the trips' own funding, to spread Christianity around the world, and defeat Muslims—and perhaps even to find Prester John, a legendary wealthy priest-king thought to reside somewhere in Africa or Asia. The Mediterranean and other ancient East sea routes were controlled by the Ottoman Turks and Venetians, and the breakup of the Mongol Empire made some known land routes unsafe. Thus came the motivation to find new water routes heading East. Prince Henry sent 15 expeditions to navigate south of the cape from 1424 to 1434, but each returned with its captain giving excuses and apologies for not having passed the dreaded Cape Bojador. Finally, in 1434 Prince Henry sent Captain Gil Eannes (who had previously attempted the Cape Bojador voyage) south; this time, Captain Eannes sailed to the west prior to reaching the cape and then headed eastward after passing the cape. Thus, none of his crew saw the dreadful cape, and it had been successfully passed, without catastrophe befalling the ship. This was the first European expedition to sail past this point and successfully return. Following the successful navigation south of Cape Bojador, exploration of the African coast continued. In 1441, Prince Henry's caravels reached Cape Blanc (the cape where Mauritania and Western Sahara meet). The expedition brought back some blacks as exhibits of interest to show the prince. One negotiated his and his son's release by promising several slaves upon their safe return home. And so it began. The first 10 slaves arrived in 1442. Then it was 30 in 1443. In 1444, Captain Eannes brought a boatload of 200 slaves back to Portugal. In 1446, Portuguese ships reached the mouth of the Gambia River. They were the first Europeans to sail that, too. In 1460 Prince Henry the Navigator died, but work continued at Sagres under the direction of Henry's nephew, King John II of Portugal. The institute's expeditions continued to venture south, then rounded the Cape of Good Hope, and sailed to the east and throughout Asia over the next few decades. The 100-year period from the mid-15th century to the mid-16th is called the European Age of Discovery or Age of Exploration, when Portugal, Spain, Great Britain, the Netherlands, and France sent out voyages to previously unknown lands and claim their resources for their country. The cheapest labor to work on plantations for crops such as sugar, tobacco, or cotton were slaves, brought on a triangular trade route, one brutal leg of which was known as the middle passage. Countries that are former colonies still suffer the aftereffects today, especially in Africa, where there is poor or inconsistent infrastructure in many areas. Some of the countries just gained their independence in the 20th century. Dowling, Mike. "Prince Henry the Navigator." MrDowling.com. https://www.mrdowling.com/609-henry.html. “Henry the Navigator.” Biography.com, A&E Networks Television, 16 Mar. 2018, www.biography.com/people/henry-the-navigator. "Henry the Navigator." Encyclopedia of World Biography. Encyclopedia.com. https://www.encyclopedia.com/people/history/spanish-and-portuguese-history-biographies/henry-navigator. "Henry the Navigator Facts." YourDictionary.com. http://biography.yourdictionary.com/henry-the-navigator. "History." Sagres.net. Allgarve, Promo Sangres, and Municipia do Bispo. http://www.sagres.net/history.htm. Nowell, Charles E., and Felipe Fernandez-Armesto. “Henry the Navigator.” Encyclopædia Britannica, Encyclopædia Britannica, Inc., 12 Nov. 2018, www.britannica.com/biography/Henry-the-Navigator. "The Portuguese Role in Exploring and Mapping the New World." Library of Congress. http://www.loc.gov/rr/hispanic/portam/role.html. "Prince Henry the Navigator." PBS. https://www.pbs.org/wgbh/aia/part1/1p259.html. 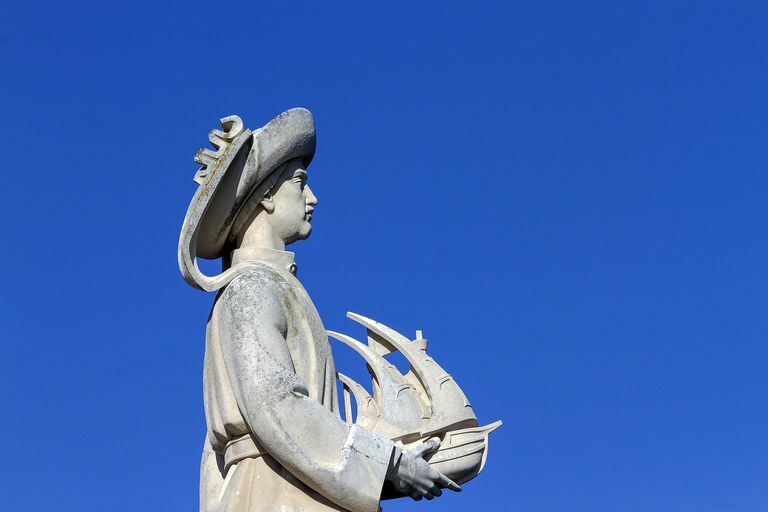 What Do You Know About Christopher Columbus?